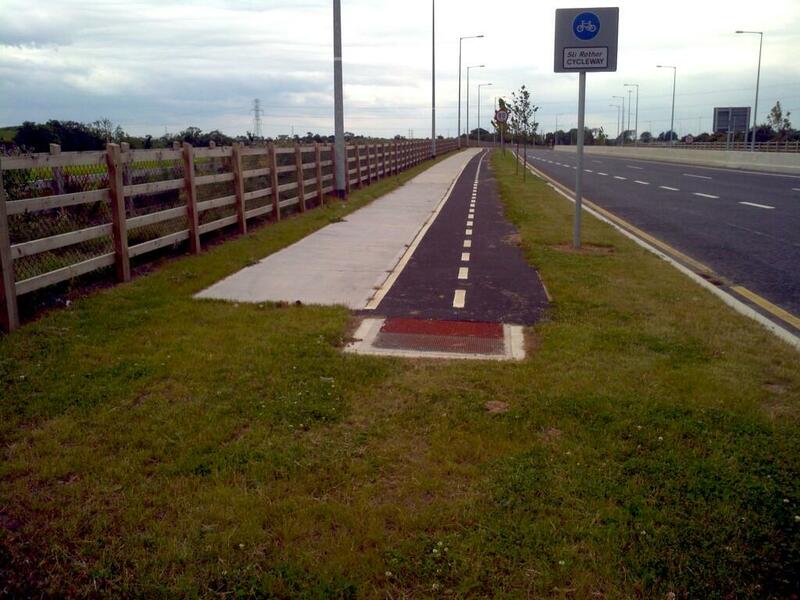 “A cycle path I used recently. You start and end it by teleporting” — we can’t improve on this comment by Eolaí the Artist. We have already covered the N2-N3 link road in a special edition, but the above feature is worth highlighting and expanding on. It’s just ahead of a major motorway-like junction with the N2 before it becomes the M2 motorway — in most other countries this section of the N2 would all be motorway. The roundabout ahead is a massive 170m long and has three lanes on it. The junction from the start of the slip roads on one side to the start of slip roads on the other is nearly 350m. The Dutch would likely grade segregate cycling and motoring in such a location, but here there is zero cycling provision to get from one side of the junction to the other. They believe in doing things on the cheap when it comes to Cycling provisions for Roundabouts like this one. They just like to concentrate on spending the money on making things easy for the Motorist and the Cyclist is ignored. Another thing is putting in very small little exit signs on Roundabouts links that are confusing and Cyclists have been known to nearly end up on Mways and having to go back up slip ways. It happened to a Brazilian friend of mine once on a Trip to either Tara or Trim on the N3/M3 on a Roundabout. She got confused by all the signs and went down one Slip way and we went after her and got her back up and off it. These Roundabouts are even worse when it starts getting Dark ,harder to see those little signs. I support the criticisms whole hardheartedly. It is obvious these facilities are designed by people that don’t cycle. It is so disappointing to see scare resources wasted on such stupid designs. It’s a loose loose situation for everyone. Unfortunately the designers are too blinkered or stupid to see that a lot of their designs are useless and wasteful. Please stop. Things are bad enough. If designers want to do something useful, either take up commuting cycling or hire someone that does. Cycling facilities must be designed by and for cyclists. We want facilities not lip service. They the designers and planners have a terrible habit of designing roads for Motorists then as an afterthought decide to put in Cycle Lanes when the road is almost finished. That Sam Beckett Bridge is a case in point where there is a sudden hill on a blind bend on the John Rogersons Quay side. Where you can suddenly clash with other Cyclists and pedestrians on the bind bend.